Exceptional coffee defines Story Coffee, Sof Alam’s first venture and exemplifies the discerning attention to detail of what could be my blueprint for a perfect coffee shop. “Everything we offer has its own story and absolute transparency, hence the name,” says Alam. The wonderfully fruity cappucino is an Ethiopian blend by Square Meal roastery and there are guest roasters such as Berlin’s The Barn for fashionable Aeropress. Unusually milk is organic from Goodwood Farm. For the summer there’s affogato too (espresso and ice-cream) plus Silverleaf Green tea from Lalani. Smoky baked eggs with deep flavour, a punchy innovative mix with cavelo nero, tomato and chickpeas devised by guest caterer Tucktogether.com is wonderfully sustaining. 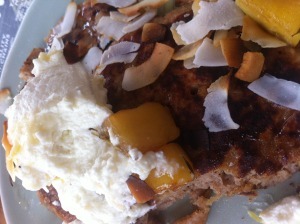 Even more deletable are quinoa pancakes with roasted apple, wild flowers honey from Oliveology, whipped ricotta and toasted coconut. The plates are gorgeous, pale blue and handcrafted. The whole design of Story is appealingly Scandi with warmth and lovely touches including the wooden crates of pastries by Comptoir Gourmand. I can’t wait to return.